If you ask any doctor what’s the number one thing that they would recommend their patients do to improve their health dramatically, it would definitely be getting a good night’s sleep. If you aren’t sleeping properly, all the good nutrition in the world isn’t going to help you really get a fresh start to your day. If you’re not sleeping right, all of the exercise in the world isn’t going to help you really meet your weight loss goals. Sleep is absolutely critical — people have gotten very sick from not sleeping enough. Given that type of power that sleep has over our lives, you would really think that people would strive to get more sleep. Unfortunately, people today are busier than they were in the past, and this means that you will need to make sure that you are getting the sleep that you need. Of course, the more restful the sleep, the easier it will be to take care of anything that life throws at you. You might not think about your mattress in the grand scheme of things, but the truth of the matter is that you will want to make sure that your mattress is as comfortable as possible. Some doctors even recommend that you replace your mattress every 5 – 10 years. That can seem like a short amount of time, but it’s actually a perfect rotation cycle for a good mattress. If you want to replace your mattress sooner, then you certainly can. However, when you really think about it, you don’t need to replace your mattress more frequently if you go with getting a quality mattress in the first place. However, who is to say what’s quality and what isn’t? These things get pretty subjective, but the truth is that there are a few points to consider when you’re serious about getting a new mattress. First and foremost, you will want to think about the size of the mattress that you want. A lot of people think that bigger is better, but the extra space could give you too much space to roll around in. If you’re used to sleeping in a tighter space, this means going with a smaller size mattress than what you might think is best. For example, you might really think about that king bed, but can you really fit it comfortably into your bedroom? It might not fit properly and this would lead you to not being able to get anything else into the room — let alone move in and out of the bed comfortably. Sometimes, a smaller size can be just what your bedroom needs to feel warm and inviting. If you want to go with something fancier, you will need to make sure that you can actually afford it. Some sites do financing, while other sites will want the full cost of the mattress up front. You also need to budget in a little bit more in case you want to get a new bed frame, headboard, and footboard. It just depends on what you actually want to see in your room. If you already have these pieces, then you can just focus on the mattress. Popular choices for mattress material include pillow top, memory foam, and even water. Yes, waterbeds are still popular, and a lot of people say that once you actually sleep on a waterbed you really don’t want to sleep on anything else. However, if you aren’t used to the feeling of being on water, then you might want to stick with a more traditional type of mattress. It’s completely up to you to decide what type of mattress that you want to get. Don’t be afraid to actually look at some reviews online from real customers. 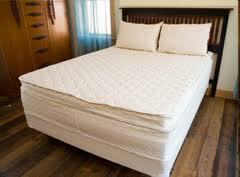 That’s the best way to determine what type of mattress that you might like. It’s better to really think about your goals in getting a new mattress than to just pick out anything that seems to look good, or what’s on sale for a rock bottom price. If you know that you’re not going to like the mattress when it arrives, why even go through the process of ordering it? Overall, there are probably a lot of other points that could be listed here when it comes to the purchase of a good mattress. Make sure that you really give yourself time to figure out what you want — it can be a tough decision, but only time can help you find the mattress that you truly deserve!